INTERVAL TRAINING = WEIGHT LOSS: Interval training exercise burns more calories than extended steady-state exercise. There's 9 fat-blasting treadmill programs will alternate cardio bursts with slower paced bouts to maximize efficiency. Run up to 7.5 MPH. POWER SAVING CONSOLE: LED backlit display shows your speed, time, distance, heart rate, and calories burned. Listen to music using its wire and wireless Bluetooth option over the onboard stereo speakers. Convenient pull up tablet and mobile holder lets you keep up with your favorite shows. Built in Body Max Index (BMI) will help you keep track of your fitness progress. Smart Console notifies you when lubrication is due, this will keep your treadmill running smooth and efficient. Automatic power-saving system has a sleep mode when left on idle. SHOCK CUSHIONING: 8 strategically placed cushioning points helps protect your joints from the impact of exercise. Compared with road running, treadmill running typically reduces impact by about 15 to 40 percent. Plus, the treadmill track is low profile (4.5" off the ground), meaning its really easy to get on/off your treadmill. Innovative console and tread cushioning offers optimal control of your exercise regimen. Increase the intensity of workout by adding up to 2 levels of incline. Walk, jog and run with its spacious treadmill running space (47.2L x 15.7W) while listening to your favorite music. 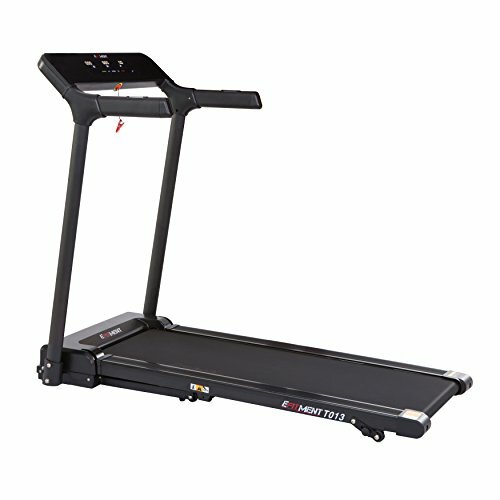 Offers simple and an effortless way to fold up your treadmill, and soft-drop mechanism to unfold your treadmill. Once folded, the treadmill has two wheels for easy mobility. INTERVAL TRAINING = WEIGHT LOSS: Interval training exercise burns more calories than extended steady-state exercise. This treadmill offers 9 built in programs. These fat-blasting treadmill programs will alternate cardio bursts with slower paced bouts to maximize efficiency. Run up to 7.5 MPH. POWER SAVING CONSOLE: LED backlit display shows your speed, time, distance, heart rate, and calories burned. Listen to music using its wire and wireless Bluetooth option over the onboard stereo speakers. Convenient pull up tablet and mobile holder lets you keep up with your favorite shows. Built in Body Max Index (BMI) will help you keep track of your fitness progress. Smart Console notifies you when lubrication is due, this will keep your treadmill running smooth and efficient. SHOCK CUSHIONING: 8 strategically placed cushioning points helps protect your joints from the impact of exercise. Compared with road running, treadmill running typically reduces impact by about 15 to 40 percent. Plus, the treadmill track is low profile (4.5" off the ground), meaning its really easy to get on/off your treadmill. Weight capacity of 220 Ibs.